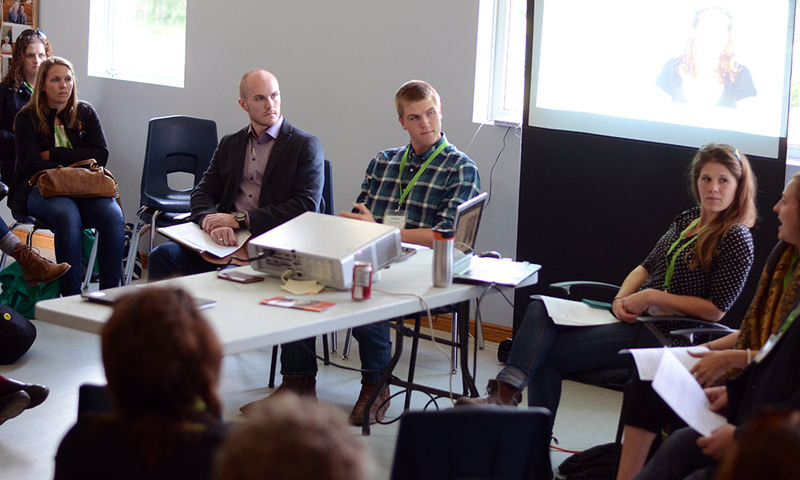 Two years after the first Rural talks to Rural (R2R) conference, the organization is planning its next installment of the event, which will focus on rural resiliency. Run by Blyth Arts and Culture Initiative 14/19 Inc., the conference, which will be held Oct. 17- 19, will feature what 14/19 Project Director Peter Smith calls overlooked opportunities. Smith elaborated on the event during an interview with The Citizen, saying sometimes assets and opportunities can be missed by those most familiar with them. Comparing a rural area to a vacation property, he said visitors to the property will see the beauty offered, while the owners may often instead see the necessary maintenance and upkeep. He said part of building rural resiliency is to focus on not being blind to those assets so they can be protected. This year’s conference features a smaller number of intimate discussions, instead focusing on larger panels, which will result in greater opportunities for unstructured networking Smith said. Smith said that two of the exciting aspects of the conference will run throughout the entirety of the event, including archiving the seminars and discussion in multiple formats and what he called a Research Tree. Market Street Strategies, a marketing company created by Allan Thompson, an accomplished journalist and journalism professor and 2019 Federal Liberal hopeful, will be bringing five journalists to cover R2R “wall-to-wall”. Smith said the event will be recorded through traditional audio and video methods as well as through blogs, interviews and social media. He said that having the archive of information will allow people to revisit ideas brought up, something he wishes could have been done for the 2016 event. The Research Tree, Smith said, will see participants provided with leaflet die-cuts to write the research needs and ideas to populate a tree. At the end of the event, the “tree’ will be compiled and forwarded to universities with rural-focused programs to help direct rural study. Starting on Wednesday, Oct. 17 registration runs from 7:30-9 a.m. at Blyth Memorial Community Hall. After the opening ceremonies, the conference will begin with a plenary seminar called “Wake Up!” by Hans van der Loo, a member of the Advisory Board at the Institute for Integrated Economic Research in Europe. The seminar is a question-and-answer event focusing on sustainability and resilience. After a brief break, a second event will run from 10:45 a.m. to 12:30 p.m. called “Making a Rural Culture Hub”. The seminar is to be run by Ben Fink of the Rural Culture Hub in Whitesburg, Kentucky. The hub is based on the idea that every community has opportunities or assets on which it can capitalize, Smith said. Blyth Festival Artistic Director Gil Garratt will be a part of the panel as well, which will discuss the impacts of rural cultural hubs. Wednesday’s lunch is provided by a group of Syrian women who recently arrived in Canada. Alongside the traditional Syrian meal, the women will share stories about their experiences coming to Canada. Wednesday afternoon will be the first concurrent sessions, offering an opportunity for conference-goers to attend a session on community wellbeing supported by Seaforth’s Gateway Centre of Excellence in Rural Health or a seminar called “Products of the System” focusing on different voices in rural decision making. The Community Wellbeing session will focus a panel speaking about rural community health from economic and social points of view and the aspects that lead up to that. The Products of the System session focuses on the voices that are left out of rural life or decision making processes, including women, the LGBTQ+ community, people of colour and Indigenous people. The seminar will focus on changing how communities are directed to include all voices. After a brief break, another plenary session called the Rural Radio Forum will be held from 4-5:30 p.m., moderated by retired The Citizen Publisher Keith Roulston and a panel of local and international rural experts. Smith is particularly excited about this panel because, aside from being deeply rooted in rural history, it will be broadcast coast to coast. The seminar will mirror the Rural Radio Forum, a radio program that reached Canadian farmers decades ago via CBC Radio. Hosted at a kitchen table, the program would feature rural experts and grassroots participants discussing rural issues. Listeners would then write their responses and send them to CBC where they were collated to be discussed later. Smith said Roulston regularly references the idea as a heyday of national rural participation, which is one of the core principles of the R2R events. The R2R Rural Radio Forum discussion will take place around a kitchen table at Memorial Hall, Smith said, and will be broadcast to five other kitchen tables from Newfoundland to British Columbia. The session will also be licensed, serving local beers and wines. After the Rural Radio Forum, the first unstructured networking session will follow. Called the Huron Sundowner, the session will have photographer Terry Manzo unveiling photos associated with living on less than a living wage. The show is part of the United Way Perth-Huron’s Social Research and Planning Council’s “How Much is Enough” report, which is underway. The report focuses on the causes and impacts of low incomes on families and communities. Smith said that, after the last R2R conference, it became apparent that people wanted a chance to talk to each other and connect in a non-regulated way. The Huron Sundowner sessions will offer people that chance. While they can take in Manzo’s show, conference-goers can also leave Blyth Memorial Community Hall to take in the village or the Greenway Trail or local businesses while chatting with fellow attendees. Wednesday’s dinner, set for 6-8 p.m., will feature keynote speaker Shanna Ratners from St. Albans, Vermont. Ratners will share her experiences managing complex research and capacity-building initiatives while analyzing rural economic development opportunities. Ratners is a researcher and trainer specializing in rural community economic development. Following dinner, there will be what Smith calls “A Newfoundland Kitchen Party” until midnight, featuring music, stories and dancing, all with an East-coast influence. Smith has invited PhD students from schools with significant rural programming to host interactive stations designed to engage conference participants. The event will run from 9:30-11 a.m. The idea behind the seminar is to create a connection between people researching rural communities and those communities. He said he hopes that the students leave the seminar with an idea of what the communities need in terms of academic focus. A plenary session focused on renewable rural communities is set for 11 a.m. to 12:30 p.m. Smith explained that members of the Wiikwemkoong First Nation people as well as delegates from Oxford County will be present. Huron County community members will also be part of the discussion, which will focus on sustainability, rural resilience and environmental management. The delegation from Oxford County will include both staff and government officials who will speak on the county’s bold environmental efforts, which have been praised by Huron County Council members. Lunch will run from 12:30-2 p.m., and will feature Dr. Ryan Gibson, who will share reflections on the morning’s Passport to Research market-style seminar. The second set of concurrent sessions will run 2-4 p.m. and see conference-goers split into three groups. The first optional session for Wednesday is called “Millennial Machinery” and will focus on what a new rural community would look like if young adults between the ages of 20 and 30 were to create it. The third session is called “Food Systems and Security” and will focus on challenges in food production from grassroots to large-scale production and water security. The second Huron Sundowner will be held from 4-5:30 p.m. with dinner following, being prepared by a local Jamaican chef who will prepare traditional Jamaican fare. Friday will start at 7:30 a.m. with breakfast and registration and after more comments from the conference organizers, the last plenary session will be held called ReSkilling for the 21st century. The discussion will be hosted by Royal Bank of Canada (RBC) Vice-President John Stackhouse who will present the results of “Humans Wanted”, a year-long, national study that focused on the skills needed for evolving workplaces. Stackhouse will be joined by van der Loo who will present work he has been doing on science, technology, engineering and mathematic fields (STEM) in Europe. Stackhouse and van der Loo will moderate the discussion and will be joined by local entrepreneurs. The day will end with lunch from noon until 1 p.m. and will feature dignitaries from every level of government reflecting on the conference.